No filling! No draining! No ice! Constantly cold and ready when you are! Portable, durable and easy to install! Plugs into a dedicated 110 volt, 15 amp GFCI outlet. Put it on any reinforced flat, level surface. Healthy, chemical-free soaking with super-clean water. HYOGA™ Cold Plunge Tub by FUROHEALTH® make the cold tub hydrotherapy experience available in a simple, totally portable, and easy-to-use system for your home. A cold plunge tub may not sound like fun at first, but the benefits are beyond worth it. Known for aiding in faster recovery times, the HYOGA Cold Plunge Tub delivers a recuperating, immune system boosting, body refreshing blast that elite athletes and trainers have come to recognize as critical to top performance. The benefits of cold tub therapy can be seen in sports as well as everyday life. HYOGA™ Cold Plunge Tub by FUROHEALTH® is a cold tub unit designed specifically for maintaining optimum health. Plunging into cold water at temperatures between 42-58 degrees Fahrenheit has been practiced for hundreds of years. It improves circulation, relieves depression, keeps your skin and hair healthy, strengthens your immune system, increases testosterone levels, increases energy levels, promotes better sleep, and invigorates your spirit. Cold tub therapy has also become an invaluable tool for trainers and coaches. Modern athletes, both professional and amateur, have learned to love the use of cold plunge therapy. The HYOGA Cold Plunge Tub shrinks and constricts stretched and warmed muscles from athletic workouts, game play, or any other strenuous activity. The decreased time it takes to recover from muscle pain and soreness allows a quicker return to full use of muscle groups and range of motion, a key component for any active person. We realize this is a big purchase. We don't take that lightly and we're here to answer your questions. Please call us at (517) 374-3876 or contact us, we'd love to help you get to know us and our products. To learn more, click here to download our brochure. Weight: (2/3 full): 735 lbs. 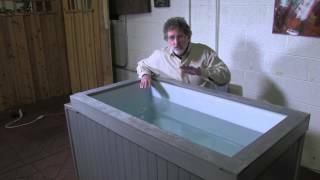 Your Hyoga Cold Plunge Tub is hand-crafted and then surrounded in a protective coating that is tough and durable. It is protected from the harshest of elements. It will be water tight, worry free and low maintenance. The polyethylene coating is UV stable and scuff resistant. The cold tub coating is nearly indestructible. All FuroHealth Soaking Tubs are made of high quality materials and constructed by craftsmen who are passionate about creating something special for others to enjoy. There may be some slight imperfections in the cabinet that in no way affect the quality of the soaking tub. It takes skill and passion to create the soaking tub by hand and the result is always beautiful and unique. You won’t find any two pieces that are exactly alike. There is a one year warranty on all parts, including the tub liner and cabinet. Cover warranty is provided by the manufacturer: Castle Spa Covers (warranty information and warranty registration). Warranties are null and void when this product is used commercially. With proper water chemistry maintenance and increased filter changes, a commercially used tub will perform equally to tub purchased for the home. Consult with your doctor before using this or any cold tub for answers to personal medical questions. Soaking in a cold tub should be a therapeutic experience, but it can also be hazardous to your health. Please get your doctor’s approval before making this product a part of your health regimen.